Presiding Officer Norma L. Gonsalves attended Boy Scout Troop 157’s Eagle Court of Honor for Eagle Scout Anthony Teneriello at the Calvary Lutheran Church in East Meadow. For his project Anthony, a resident of East Meadow, performed a restoration of a gravel labyrinth pathway, a butterfly garden, and the construction of a new shelter for a rescued porcupine in the Tackapausha Preserve. Anthony edged, weeded out a put down a fresh layer of gravel and made additional maintenance renovations to the butterfly garden including trimming the bushes and planting perennial flowers. 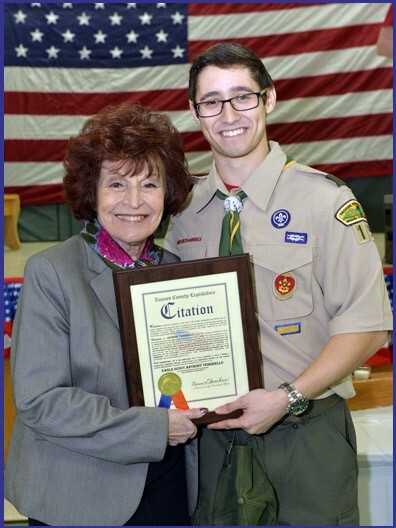 Pictured (l-r): Presiding Officer Norma Gonsalves and Eagle Scout Anthony Francis Teneriello.